At the time of writing this, spindle spacing's need to be less than 4 inches or 100mm apart in the U.K. at their widest point in order to prevent toddlers falling through them or getting their head through and becoming stuck or worse strangling themselves. If you have a 100mm ball or close you can use that to test the gap. You will need to bear this in mind particularly if your spindles are moulded/turned as the gap will obviously get wider at points where the spindles become narrower. Always check with your local council/building inspector if you are unsure of the maximum permitted dimension in your area. Which tools do you need to install stair spindles? If you haven't already done so, use the formula here to calculate how many spindles are required in your staircase first. The picture below demonstrates how in a nutshell I calculate the spindle spacing's. There are a couple of methods but this is the quickest and most accurate I have found for reasons which will become clear as we go through. Because I cut them all to length and fit them together tight at one end first, they are all within easy reach as I start to install them. I can easily grab one, glue it, fit it, nail it and move on to the next one, getting a bit of a speedy system going. An angled run uses the same theory though slightly more care is required to get them perfect too. Whether you are installing balusters on a staircase, balcony, garden decking, veranda, porch, anywhere else or if you are working on a horizontal or diagonal balustrade - the theory is exactly the same. I use my DeWalt cordless nail-gun to fix the spacers in place, and the packers in the hand and base rails. 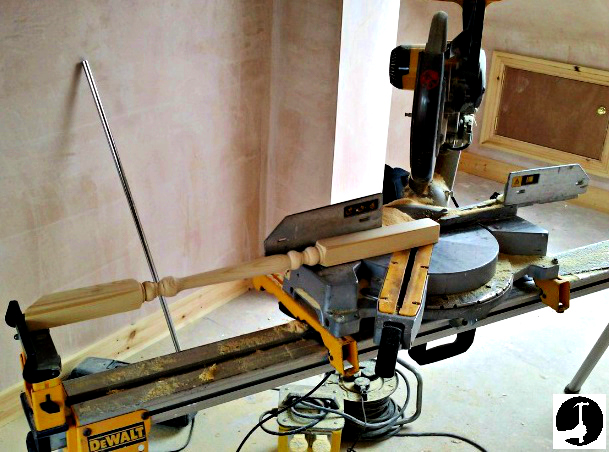 The advantage of a nail gun is the heads of the nails are buried just under the surface of the timber so they can easily be filled with natural wood coloured filler afterwards. Also, using a hammer and nails can lead to the handrail 'bowing' up when you're nailing the top of the balusters to the handrail (mainly on an angled run). A nail-gun and 600mm spirit level helps to avoid causing this problem. If you don't have a nail-gun, it's perfectly OK to use 30mm panel pins to fix the balusters and railing spacers instead. Keep an eye on the hand rail all the time as you fix them by looking down the length every so often, to make sure it is straight. If the hand rail and base rails are going to be painted, you could fix a brace temporarily to the handrail to keep it perfectly straight while you work on it. Step 1: Cut the spindles. Cut the spindles to length and put them all in at the bottom of the run, up against the post and each other. Square spindles are easy to cut to length but turned spindles need a bit more care. Use a bevel to work out the correct angle to set your saw to, and for turned spindles try to keep the turned section central or slightly higher than central within the spindles length. This may mean marking the angles/length top and bottom before cutting and checking it will look right, and adjusting if not. Rather than cutting first and realising after.. If you have a saw and bench like mine you can set up a stop like above to cut them all the same length quickly. If not, use one spindle as a pattern/template and be really careful when transferring the length onto the other spindles. Make sure they are exactly flush with each other, if not and they are on an angled run this will affect the length. This is the same as the diagram before, you can just about see in the blurry picture above I had to clamp a long spirit level to the inside edge of the top newel post so it could hang down for me to hook my tape measure onto it for a perfect horizontal measurement (the spindles are tight up against one another just to the right out of shot). 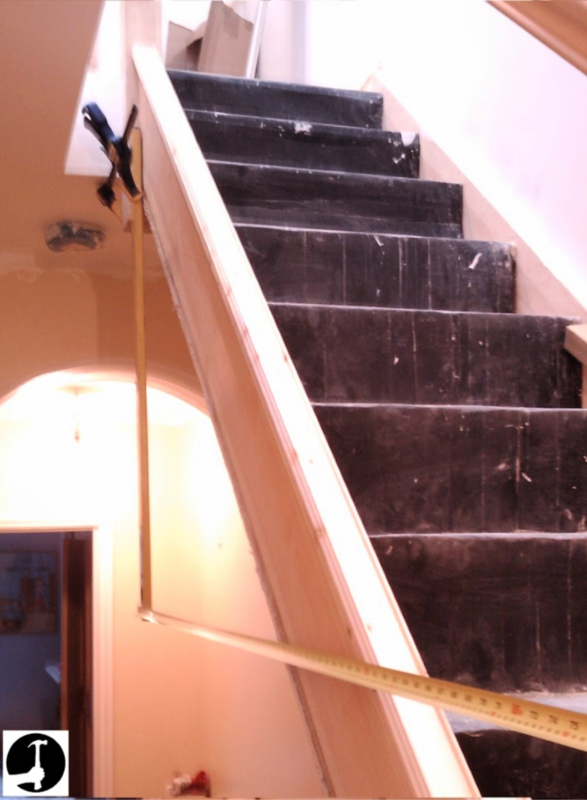 If you have a really long run of spindles and an odd number of spindles in total to install, then you can instead find the exact centre of your angled staircase run and fix a spindle perfectly plumb there. This will create two equal but separate smaller/more manageable angled runs to work with - one top and one bottom. This can also help to fix and hold the handrail perfectly straight too whilst you work on it, you could even put a screw in the spindle top and bottom to make sure it is really strong and wont budge at all during the installation of the rest of the spindles. 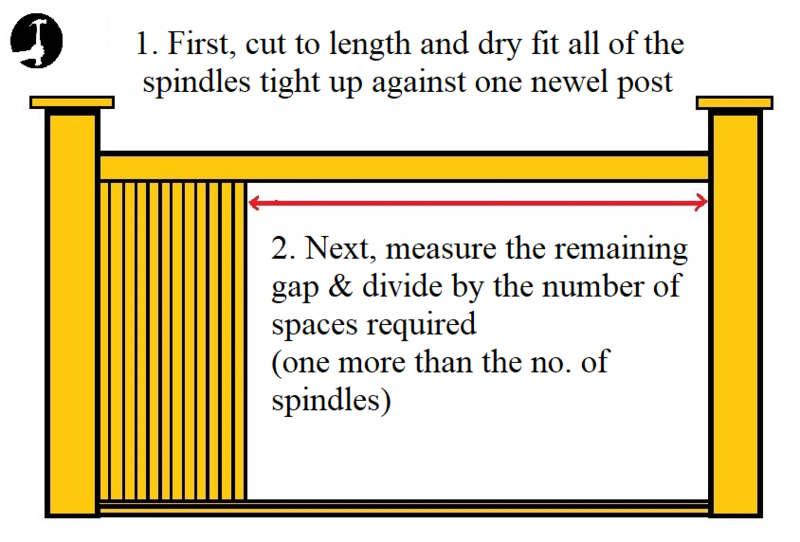 Step 3: Divide by the number of spindle spacings needed (gaps). You should have one more spindle spacing than there are spindles. So if you have 10 spindles, take the measurement from step 2 and divide it by 11, for example. This will give you the <b>horizontal</b> distance apart each spindle spacing will be. In the UK, the regulations state that you cannot have a spacing of more than 100mm (horizontally) between spindles at their widest point, because a child could fall through or even get their head through and strangle themselves. To be on the safe side I always aim for around 90mm spindle spacings unless it is absolutely unavoidable (because the gaps will look stupid - way too large/small). If the answer comes to more than 100, cut another spindle and add it to the others before re-doing step 2. 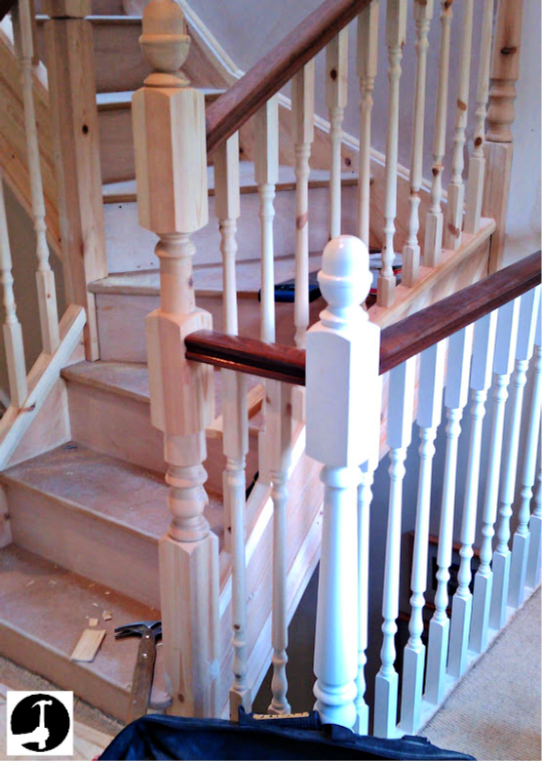 Add or remove spindles until you have a gap you are happy with and that complies with your local regulations. Normally around 70-80mm looks good and ensures that even with turned spindles the gaps won't exceed 100mm. If there are several 'runs' that need spindles I will work out the spacing's for each run before gluing and nailing any of them. If there is a huge variation between sections, then I may add a spindle to the section with the largest gaps or remove one from the section with the smallest gaps to try and get the spindle spacings as even and close to each other as possible so they all look as close as they can. Grab a bit of the spacing strip about 300mm long, or cut a piece this long with the angle of the staircase pitch (set a bevel up where the hand rail meets the newel post). 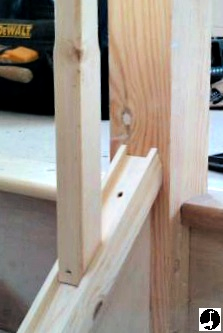 Use a tape measure or ruler to place a spindle in the grooves the correct distance away from the top newel post. If the spindle doesn't fit tightly in the hand and base rails, pin the bottom of the spindle temporarily so it stays put. Like in the picture below. Hold the spacer up to it and mark the length with a sharp pencil. With the chop-saw still set to the staircase pitch, cut the angle on one end of the spacer, offer it up to the spindle to transfer the measurement with a razor sharp pencil and cut to length. Use it to mark another so you have an identically matching pair. Put these in the grooves of the hand and base rail dry, checking they fit perfectly between the post and the spindle you have placed at the right distance away. If they're OK and leave the correct spindle spacing calculated in step 2, move to the next step otherwise trim or cut two new ones until you are happy with the length. If you are working on a diagonal run and your spacing timber is a different thickness for the base rail to the hand rail which does happen especially if they are from different manufacturers, you will need to calculate the length for each separately. A thicker strip will need to be very slightly longer than a thinner strip! Next, grab an off-cut of timber and a good woodworking clamp. If possible, lock the Chop-Saw blade down low and hold the spacer up to the blade ensuring it is tight and flat against the saws fence. Don't push the against the blade so hard the blade moves. 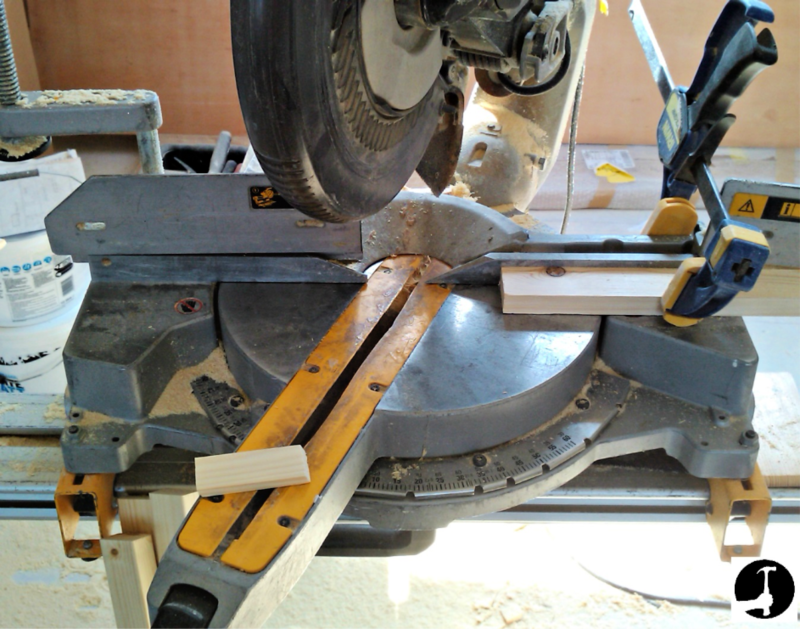 With the spacer held up to the blade, offer the timber off-cut up to the spacer before clamping it against the fence. This will act as a 'stop' for making accurate repeat cuts. You will need two spacers per spindle spacing, but only cut a third to half the amount needed for now. As always, cut a test pair and check they are perfect, adjust if necessary before cutting more. Always take care when cutting these, make sure the material is flat against the fence there is no sawdust in the way, and you bring the sharp saw blade down slowly, letting the blade cut. Too fast and you will lose accuracy and these are crucial to get spot on. Step 5: Glue and pin the spindle spacers in place. Using a little PVA glue and some 30mm panel pins or a finish nail gun fix the first two spacers in place, one top one bottom. I normally put glue on one spacer and rub the two together to spread the glue before sliding them in. Make sure to slide them back and forth a little in the groove so they are tight against the newel post and perfectly flat in the routered out groove. If they're really tight you can use a block plane to put a slight leading edge on them. Make sure you punch the nail heads under the surface so they can be filled by the decorator later on. Sometimes I'll fill these with some wood coloured filler myself for a neater finish particularly if the staircase is hardwood and not being painted. It looks more impressive to the customer when they come home, everything looks perfect and they can't see the tiny nail holes. Glue the top and bottom of a spindle and fit it in place, then pin and punch the bottom of the spindle to the base rail where it will be covered by the next spacer if possible, being careful not to dislodge the previously fitted spacers. Again, a slight leading edge on the angled part of the spindle may help it to slide back and forth easily while you position it in the base-rail. As mentioned, it's important now to keep an eye on the handrail as you fill it up to make sure it doesn't start to bow upwards when you nail the top spacer. Using a nail-gun and holding the handrail firmly in place pretty much eliminates the chances of that happening. When you've fitted a third to half the spindles in place stop and re do step 2. If you are 1mm out on each spindle spacing and there are 20 spindles, by the time you get to the bottom you'll be 20mm out and it will look rubbish! You've probably seen a staircase where the spindle spacings are equal until one end where the last one is much smaller/bigger. Check now, and if you need to adjust the spacers up or down a mm or two do it while there is time to lose the difference gradually. Now take all the remaining spindles out of the bottom and start fitting from the bottom up. I do this because you almost always have to adjust the last two spindle spacing's at the end by 1 or 2mm and its better to have that slight variation in the middle of the run where it will blend in and be much less noticeable than at the post where it will stand out. Step 8: Perfectly spaced spindles.. put the kettle on and admire! Spindles installed perfectly, what's next? Use the comments section below to add your own staircase fitting tips!